Preheat the oven to 180°C, gas mark 4. Place 12 paper muffin cases in a muffin tray. Using an electric hand whisk, beat the butter, sugar and vanilla together until very pale and creamy. Gradually add the beaten egg, then sift in the flour with the baking powder and the cocoa and, using a metal spoon, fold in carefully. Spoon this mixture equally between the muffin cases. Place in the oven and bake for 20-25 minutes until the cakes have risen and a skewer when inserted into the middle of a cake comes out clean. To make the chocolate icing, melt the butter with the cocoa in a bowl placed over a pan of simmering water, or microwave on high for 1 minute. Add the milk and the icing sugar, and beat until smooth and glossy. Place a little of the icing on each cake and smooth with a small palette knife dipped in hot water. Meanwhile, prepare the decorations. Place the royal icing sugar into a small bowl with 1 tbsp of water and beat to a paste. Continue beating until shiny and smooth. Spoon a third of this icing into a disposable piping bag. Add the tube of red food colouring gel to the remaining icing, mix to a even red colour and spoon into another disposable piping bag. 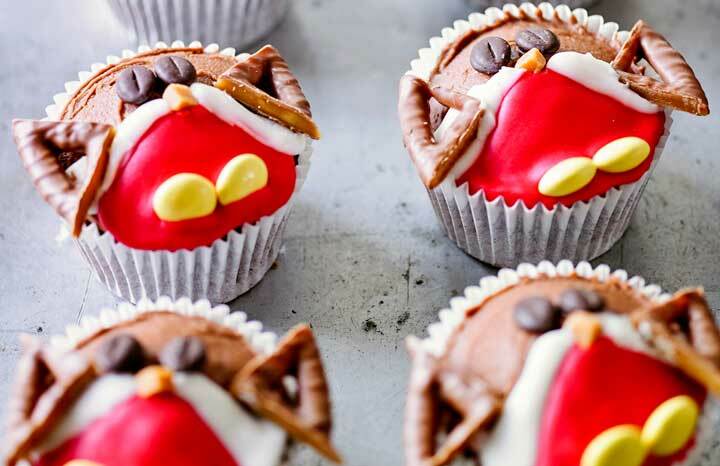 Pipe an upturned ‘U’ shape with the red icing and fill in the centre lower half of each cupcake, to form the robin’s breast. Then pipe a white dash on either side of the red breast. Press 2 yellow or brown Smarties into the base of the red icing as feet. Then place 2 Curly Wurly triangles on either side to form the wings and a piece of fudge at an angle for the robin’s beak. Finally press on 2 chocolate beans for its eyes.